Genuine German Beers Are Worth Tracking Down And Leave No Ill Effects Next Day! Ah. The delights of the micro-brewery. I'll never forget the novelty of pitching up at the first one, ducking under the giant grain funnel to push open the doors and breathe in the gloriously hoppy aromas. Glasgow has a few to offer and we'll be sure to cover then all as we toodle along. Don't forget to [RSS] us to keep up with the new reports as soon as they're filed. 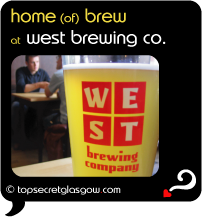 West Brewing Company: Quality German Food and Home Brewed Beer. Great news! Finding this page means you can now join our VIP list for DRINK Genuine German Beers. Time to grab your very own page for DRINK Genuine German Beers. Do you have a special story about a time you decided to DRINK Genuine German Beers? A funny experience? A grand occasion? A funky photo? A personal tip? A top secret?